In a delicious irony, the Jewish Communist historian Howard Zinn spent the first part of his classic, Peoples’ History of the United States excoriating the goyim for Christopher Columbus’ atrocities. Turns out Columbus was Jewish. In fact, as the Dearborn Independent explained in 1920, the rapacity of Western imperialism largely can be attributed to Jewish finance in the guise of national interest. Makow comment- Keep in mind that you have been mentally conditioned to eschew this kind of information. They were not, however, refugees, for the prophetic navigator’s plans had aroused the sympathy of influential Jews for a long period previously. 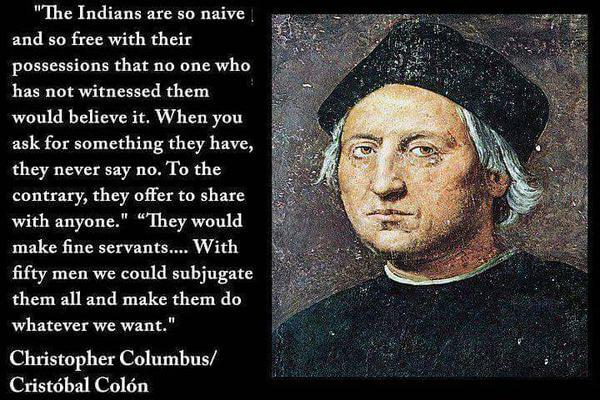 Columbus himself tells us that he consorted much with Jews. The first letter he wrote detailing his discoveries was to a Jew. Indeed, the eventful voyage itself which [discovered] “the other half of the earth” was financed by Jews. The story that it was Queen Isabella’s jewels which financed the voyage has disappeared under cool research. Three Maranos or “secret Jews” who wielded great influence at the Spanish court were Luis de Santangel, who was an important merchant of Valencia and who was “farmer” of the royal taxes; his relative, Gabriel Sanchez, who was the royal treasurer; and their friend, the royal chamberlain, Juan Cabrero. These worked unceasingly on Queen Isabella’s imagination, picturing to her the depletion of the royal treasury and the likelihood of Columbus discovering the fabulous gold of the Indies, until the Queen was ready to offer her jewels in pawn for the funds. But Santagel craved permission to advance the money himself, which he did, 17,000 ducats in all, about 5,000 pounds, perhaps equal to 40,000 pounds today. 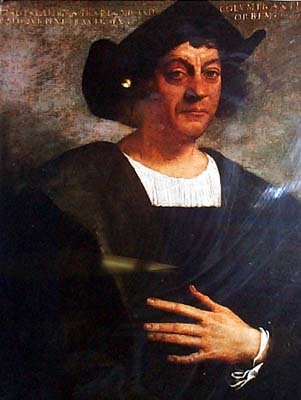 Associated with Columbus in the voyage were at least five Jews: Luis de Torres, interpreter; Marco, the surgeon; Bernal, the physician; Alonzo de la Calle, and Gabriel Sanchez. Luis de Torres was the first man ashore, the first to discover the use of tobacco; he settled in Cuba and may be said to be the father of Jewish control of the tobacco business as it exists today. Columbus’ old patrons, Luis de Santagel and Gabriel Sanchez, received many privileges for the part they played in the work, but Columbus himself became the victim of a conspiracy fostered by Bernal, the ship’s doctor, and suffered injustice and imprisonment as his reward.